Having cleared my longarm storage I have access to a sofa. This is a somewhat novel experience. Normally it has bolts of wadding on as my longarm is in what used to be a sitting room. The sofa is what one might call mature, it is certainly old enough to drink and vote shall we say It isn’t as plump as it might once have been so I figured it could really do with some cushions. I like texture so thought some furry ones would be good and started hunting online. Of course the problem with that is you can’t feel it online and I am very picky. Then it dawned on me. I have some pillow blanks and I have fabric I like. Turns out most of my cushion blanks are round but never mind it will work just fine. 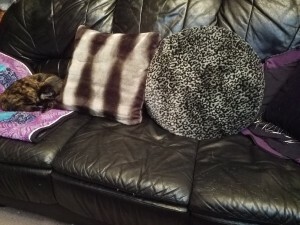 Here are 2 of the 3 cushions I made. They have zips, not that I am sure I would want to wash the fur, but you never know. The quilt under the cat was fondly named ‘dog bed’ and is one of the quilts bound this holiday. It isn’t exciting but the cat loves it, far more than she likes the sofa. I guess I aught to rename it but she has also claimed the woven quilt I made so I may call that one ‘cat bed’. Hmm, given the pattern maybe it should be cat’s cradle. I will have to think on that. As well as the cushions I made a bit more progress with the quilt on the frame and tested out a new dinner recipe. I think I will call that a productive day.